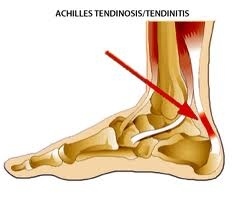 With Achilles Tendonitis patients experience pain and sometimes swelling at the back of your foot just above the heel bone (calcaneous) where the tendon attaches . The Achilles tendon, which is the strongest and largest tendon in the body connects the leg to the foot as it stretches from the lower leg to the heel bone. Achilles tendonitis is best treated early in the development of the condition. If you are experiencing pain and/or swelling in this region, a consultation with Dr. Blackmer will give you the best chance for a full recovery.